Why does this zombie look frightened? I don’t actually know. Maybe it’s because he knows that he is about to be submerged underwater for the rest of his life, and zombies can’t breathe underwater. Or at least, not as far as I am aware of. I’m getting distracted again. Seriously, I love this ornament. 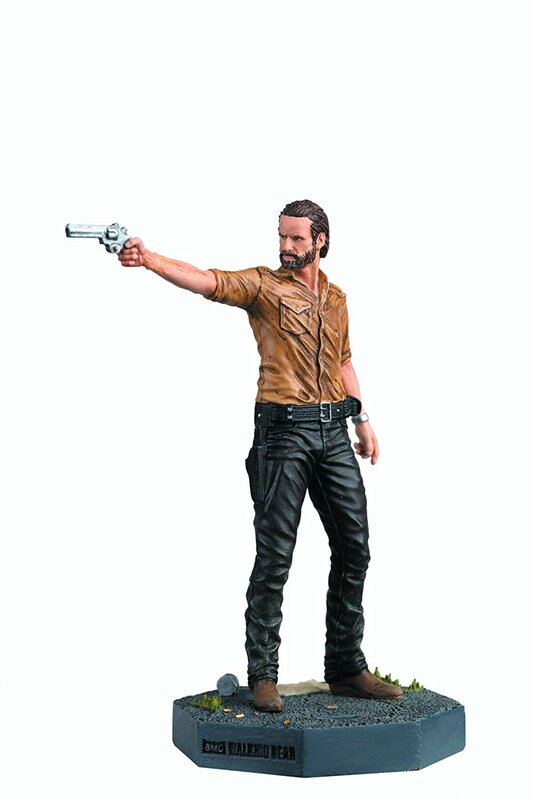 It looks great, it’s very well detailed, and is great value for money. 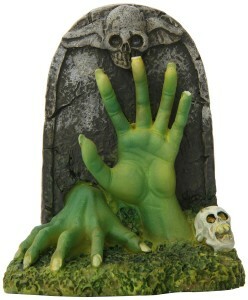 Plus, it will look awesome in your fish tank during Halloween, without being too freaky. And of course, this ornament is totally safe for use around fish (in fact, it’s what it was intended for!). To find out more about this item, and to see pricing, click on the green button above to be taken to Amazon. Although freaking your fish out for Halloween might be the last thing on your mind, if you’re feeling cruel, this is the ultimate way to do it. 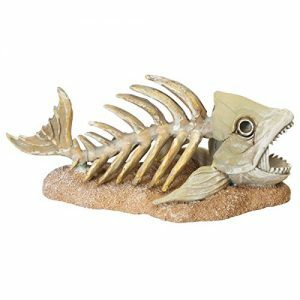 Picture the scene; your fish wakes up, fresh from a dream about coral or something, and comes face to face with this monstrosity. It would be a glorious trick or treat. And the folks over on Amazon seem to agree with us. This item has a ton of love in the reviews section, with people commenting on how well made it is and how detailed it is. Which is pretty nice of them. If you want to read some of those lovely reviews, be sure to press the green button above this paragraph. What is it about this ornament that we love? Maybe it’s the unknown element. Whose hands are those? We’d rather not know to be honest. But I’m sure your fish will enjoy these green hands as company. One of the coolest features of this item is that the hands actually glow in the dark as well. Which is a really great extra, and makes this the perfect item for celebrating Halloween with. If you wanna check out this decoration a bit closer, be sure to click on the green button above. 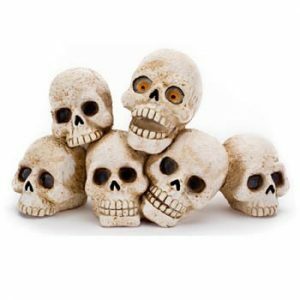 Anybody who visits FishTankBank regularly will already know that we kind of have a soft spot for skulls on this site. In fact, we freakin’ love them. So when we stumbled across this cool decoration with a zombie skull at the top, we knew it would be perfect for this list. Not only does the item look great, with every skull being very well detailed, but it also has a cool feature in that it glows in the dark, making it even better for Halloween. Even if you just like having freaky stuff in your tank, this is perfect. Plus, it’s made from a special resin that makes it totally suitable for underwater use. To get more details on this decoration, click the green button. 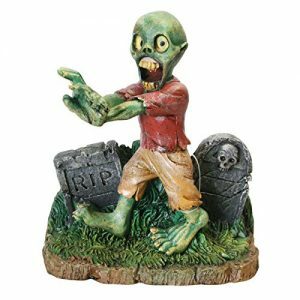 So there we have our list of fish tank decorations celebrating the wonderful world of zombies. We hope that you have found something here that will help you freak people out all year round, whether they are fish or human. All of the items above have been added to this list because we genuinely think they are awesome, and they fit the bill in terms of what we usually look for. In case you don’t already know, we only add items that are high quality, great value for money and just look really cool too. Feel free to check out some of the other items we have here on FishTankBank!